Hello folks and welcome to the second part of the regularly scheduled tier list updates, the FOTM List. Similar to the other list, Taric and Ekko still dominate the high end. In terms of the rest of the champions though, it looks like general player preference still lies with highly skill intensive mobile champions. Aurelion Sol [Tier 2 Mid] - After initially good reviews on Aurelion Sol but mixed ones from the general population, he was nerfed to a point where he's now considered decent, but not a core powerhouse as a mid-laner. Comparatively, he's about as difficult as the other popular mid laners, but with less flashy utility. Corki [Tier 1 Mid] - Despite continuous nerfs to Corki, he remains one of the key mid-lane picks for players who want to auto-attack harass with decent poke. As a high magic damage-based mage, he still works well in a variety of situations. His package is also undeniably strong, and can definitely impact games very hard. Ekko [God Tier Top] - Nerfs from patch 6.8 targeted the base damages of his kit and buffed up the scaling damage portion a bit. However, this made almost zero impact on his build pattern and playstyle. He's clearly markedly weaker than he was before, but still overwhelmingly strong. Ezreal [Tier 1 Marksman] - Patch 6.8 nerfs to Iceborn Gauntlet hit Ezreal hard this time around. By reducing the overall AOE damage on Ezreal, his classic blue build is much less effective in terms of AOE poke and burst damage. Fizz [Tier 1 Top] - The tank meta is strong with this one, and Fizz is climbing rapidly on up as a difficult to beat down champion with high damage from autos via his Seastone Trident (W). Nerfs on Iceborn Gauntlet hit him slightly, but as a primarily single target champion, he's still doing perfectly fine. Graves [Tier 1 Top] - After the nerfs to Graves this patch, his tank build deals much less damage than before except for some lucky crit sprees. He's definitely still very strong, but not as overwhelmingly consistent as he was before. Rumble [Tier 2 Top] - Riot really wants to see Rumble back on the scene, and after patch after patch of tiny buffs, he's finally in a playable to strong position again. Players are picking him up and finding him to be decent, if not excellent in lane. He still has his bad match-ups, but a Corki + Rumble combination has so much AOE cut-off potential that we might be seeing them back on the field soon, even with the Corki nerfs. 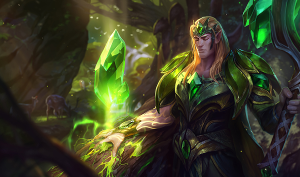 Taric [God Tier Support/Tier 2 Jungle] - The new Taric makes for an extremely strong support at the moment, with excellent synergies in a duo lane and potential double stuns. He's very difficult to kill as a result of his damage mitigation spells, and is definitely shaping up to be a major powerhouse. As for jungle, people still aren't sold on him, but are willing to give it a try considering how good he is in a support role. Tristana [Tier 1 Marksman] - Ever since the Guinsoo Tristana hype took over the professional scene, the trickle down to the amateur stage has shined through as well. Nowadays, Tristana sees a rough balance as a Tier 1 Marksman, but there are definitely those who think she deserves a spot higher as well.